Just like any typical red blooded male I love my breakfasts, and yes I am a dude food blogger. You may think they don’t exist but I am proof to the contrary, rare as we may be. Ladies don’t get your hopes up though, I am already taken and my lovely wife makes the best breakfasts ever. This recipe is one of her creations that we both enjoyed in the past and since I am known to stumble around the kitchen every now and then, this is my tentative to surprise her from few days ago. But let’s talk breakfast here for a second. Breakfast, as they say, is the most important meal of the day, and I couldn’t agree with this more. Not because it energizes you and keeps you full longer or keeps you from snacking throughout the day, but simply because I love breakfast food. Show me the bacon, the fried eggs, the sausages, pancakes, waffles, muffins, bacon, oh I already mentioned bacon, give me hash brown, huevos rancheros, the omelettes, scrambled eggs or poached eggs, you name it and I’m there. Breakfast for me encompasses comfort food at its finest. I could live on breakfast food alone. Sometimes if you give me a really good, hearty and delicious breakfast, that’s all I need for the entire day. But let’s not digress any further and discuss these eggs here. Quail eggs, my friends. Little, delicate, delicious quail eggs. I feel like those words should not have come from the mouth of a man, but there, I said it. I refrained from saying adorable though. These quail eggs in hash brown nests though, are the quintessential breakfast for me, hash brown and eggs, can’t get any heartier than that. But I’ll let you be the judge of that. Give this recipe a try. I strongly suggest you use the quail eggs here if you can find them, they are richer in taste and way better than chicken eggs. Enjoy! Preheat oven to 300° F / 150° C. Grease 4 ramekins really well. In a bowl, mix shredded potatoes, egg, Parmesan cheese, salt and pepper. Divide the mixture in 4 and fill each ramekin with the shredded potato mixture, and press down in the middle to form a nest. 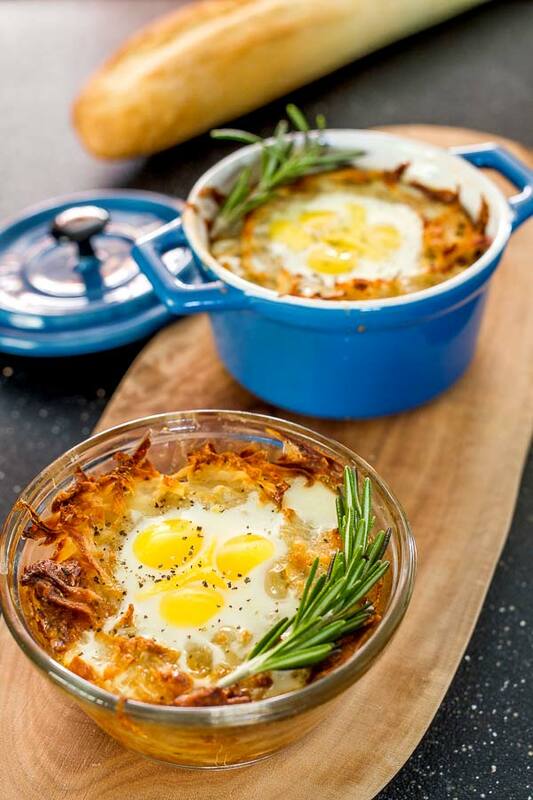 Bake the hash browns nest for about 30 to 40 minutes or until crisp and brown. Crack 3 quail eggs in each nest and season with salt and pepper. Bake for an additional 5 minutes or until eggs are cooked to your preference. Arrange rosemary around the edge of the ramekins if preferred. I can’t say that I cook with quail eggs often. But after seeing this post I definitely am motivated too – these little baked quail eggs in a basket look divine!